For all those who are drawn like a magnet to those beautiful French macaroons by Laduree, here's something to feast your peepers on. 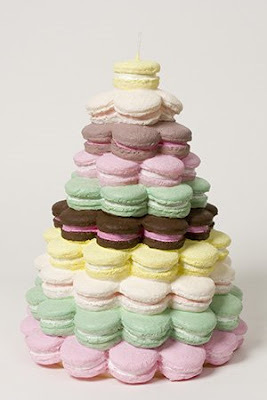 I just caught a glimpse of these macaroon candles (by way of Design Sponge) sold by Rose and Radish's new shop, Fete in San Francisco. I would have trouble not sinking my teeth into one of these - they look so delicious! An ingenious idea for a tea party centerpiece!! In "Candles", "Macaroons", "Rose and Radish"